Outline | Tonogayato Gardens | Let's go to the Gardens. From the second to fourth years of the Taisho Period, this garden was created as part of the grounds for a residence for the Vice-President of the Manchurian Railway, Eguchi Teijo. It was designed and built by a landscape gardening organization located in Akasaka called "Sengoku." In 1929, it was purchased by the founder of Mitsubishi, Iwasaki Yataro. Based on a design created by Tsuda Saku, a main residence building and tea ceremony building (Kouyou-tei) were added and a combination Western and Japanese-style strolling garden with trees and ponds was completed. 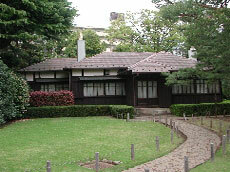 In 1974, until this garden was purchased by the City of Tokyo, the Iwasaki family used the buildings and grounds as their residence. The garden is located on the southern edge of the Kokubunji rift line. The natural flora in the Musashi plateau and the cliff-like rift area are well protected. Thus, it is possible to observe many kinds of wild grasses, insects, etc. that have been living in this area since former times. In the Jiro Benten Pond in the garden, there is a depression that contains a natural spring that provides large quantities of fresh water. Water that runs off the cliff collects in this area and is part of the source of the Nogawa River. As can be seen from the above, this garden has features that differ from the other gardens in the Tokyo area.